The music and songs of the Holocaust were created out of pain, desperation and death. The authors, many of them unknown, captured moments of separation, starvation, anguish and humiliation, to tell the annihilation of the Jews in the ghettos and concentration camps. Of the fifteen thousand children sent by the Nazis to the Terezin concentration camp for extermination, only one hundred survived. 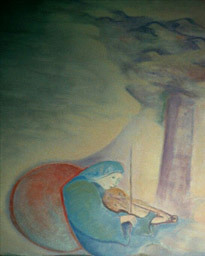 Many prisoners were talented musicians, writers and artists, who not only developed the children's creativity but also used their teaching as ways to relieve their anguish and suffering. Unfortunately, both children and adults were sent to the gas chambers. Meanwhile, the rivers flow another way. to sleep again . . . The heaviest wheel rolls across our foreheads. I can love it more that I did, somehow. When we'll go home again.